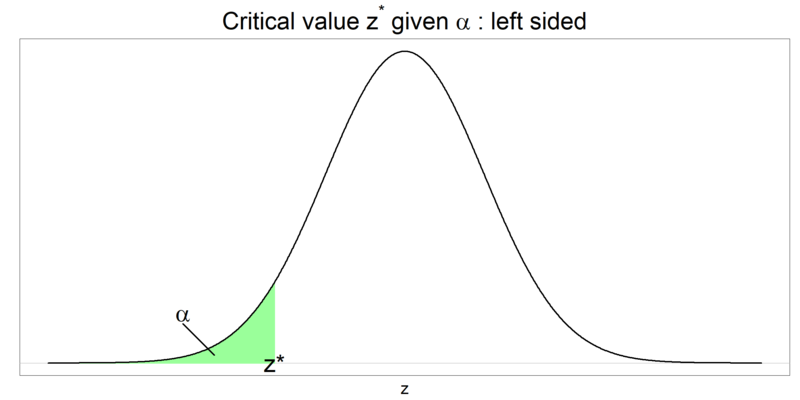 Reject the null hypothesis if the observed $z$ falls in one of the two most extreme $\alpha$ / 2 areas of the standard normal distribution. In order to find the critical values $z^*$ and $-z^*$ that correspond to these tail areas, look for the $z$ value that has area $\alpha$ / 2 to the right of it (this is $z^*$) and the $z$ value that has area $\alpha$ / 2 to the left of it (this is $-z^*$). Observed $z$ values that are equal to or larger than $z^*$, and observed $z$ values that are equal to or smaller than $-z^*$, lead to rejection of the null hypothesis. 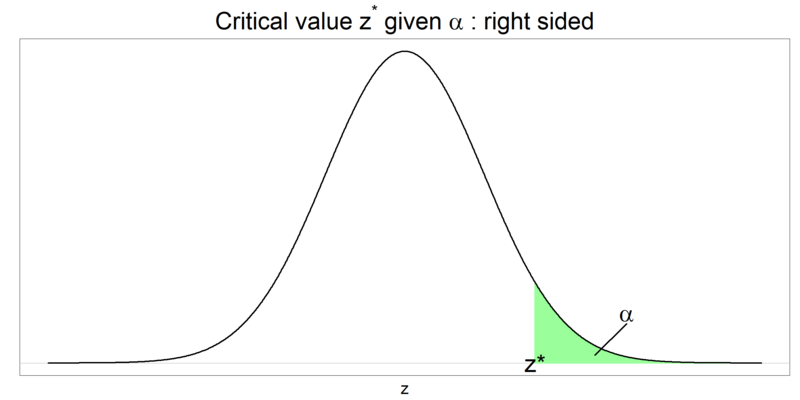 Reject the null hypothesis if the observed $z$ falls in the highest $\alpha$ area of the standard normal distribution. In order to find the critical value $z^*$ that corresponds to this upper tail area, look for the $z$ value that has area $\alpha$ to the right of it. Observed $z$ values that are equal to or larger than $z^*$, lead to rejection of the null hypothesis. 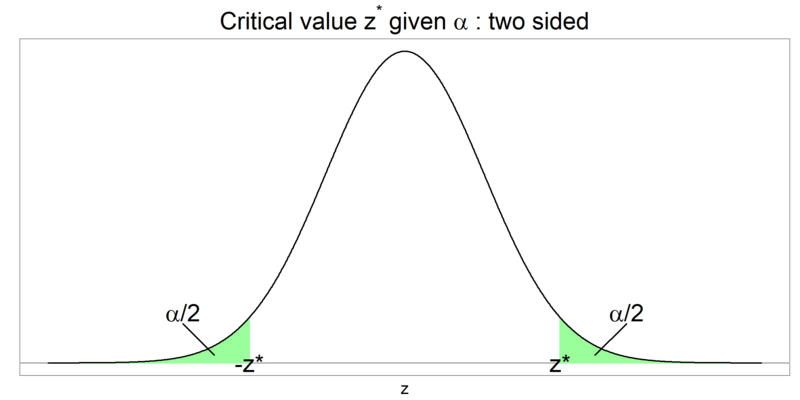 Reject the null hypothesis if the observed $z$ falls in the lowest $\alpha$ area of the standard normal distribution. In order to find the critical value $z^*$ that corresponds to this lower tail area, look for the $z$ value that has area $\alpha$ to the left of it. Observed $z$ values that are equal to or smaller than $z^*$, lead to rejection of the null hypothesis.